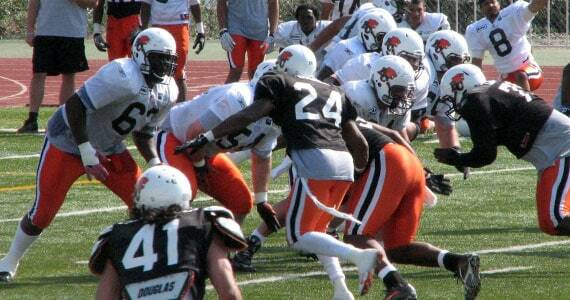 So you’re heading up to Kamloops to check out BC Lions training camp. If this is your first time, there are a few things you need to know and hopefully this guide will help you come prepared for anything that might happen! This will be my 9th consecutive trip to training camp so I’ve learned a few tricks of the trade and thought I would share them here. I’ll be in Kamloops from June 7th through Fan Fest on June 10th and hope to meet a few Lions fans there during my stay! Kamloops is known for its lack of rain, but that doesn’t mean you should leave the rain gear at home. I’ve sat in the stands and been hit by flash thunderstorms that bring heavy rains, hail and wind. It’s not common, but come prepared for everything. Sunscreen is of course a must. For the first week of camp the weather looks a bit iffy. If you’re coming up for the day, be warned. 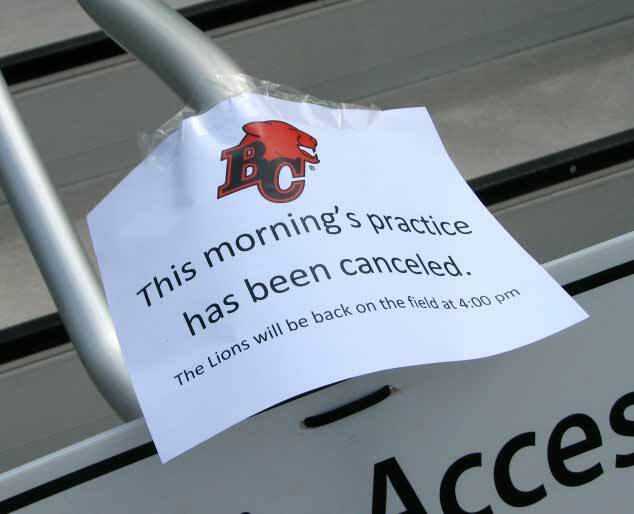 The Lions can cancel a practice session at any time. Coaches may not like the weather forecast; they may feel the players need a break, or that a film session would be more beneficial. There is also the chance the team may decide to have a “closed’ practice inside the field house at the university. The team’s media people generally try and give ample notice of this, but I have shown up to the field once or twice to find that the session has been cancelled. Follow the BC Lions on Twitter (@BCLions) and check their web site for the latest announcements, especially if you’re just planning to come up for the day. The Lions have a great setup at Thompson Rivers University. The players accommodations are located here, and they practice at Hillside Stadium. The parking on site is free during Lions practice sessions, so don’t by a ticket. If there is one piece of advice you’ll be thanking me for it will be my tip to bring a cushioned pad to sit on. The stadium bleachers are not comfortable! It’s important to remember that the BC Lions are here to work. Training camp is very important for the players and coaches, and they should not be bothered while they on the field working. Take all the photos you like from the stands, but fans are not allowed on the field (including this blogger). The players are great with the fans and many will come over to the stands to mingle with fans following any given practice section. Be polite, and they will sign and even pose for a picture. Fan Fest on June 10th is the best way to get quality time with your favourite player and they are more than happy to interact with the fans on this day. One of my favourite parts of training camp is listening to the players talk amongst themselves on the field. The defence in particular likes chirp a lot, particularly at the offensive players. There can be some really amusing lines that get thrown around. Also, don’t be surprised if tempers flare occasionally and the occasional fight breaks out. The toll of two a days can cause the blood to boil. One of the great things about the CFL is the friendships you can make with other fans. Lions Nation is growing by leaps and bounds every year. Every year at Grey Cup I am seeing more and more black and orange, and that’s great to see. If you see me, stop by and say hello, sit down and talk some football. Who knows we all may end up in a pub somewhere talking about our team. If you’re planning to come up for more than a day, there are plenty of hotel and motel options in the “Tournament Capital of Canada”. Look around for the best deal but you can expect to pay between 80-125/Night for a decent place to stay. My personal preference is the Accent Inn. It’s clean, reasonably priced and close to everything. If camping is more your thing, there are several camp grounds in the vicinity as well. With an early morning session and an afternoon session there is plenty of downtime to be had between all the football. Kamloops offers plenty of things to do for all ages. Riverside Park is a great place to spend a few hours, and it has a water park for the kids. Explore the local pubs and restaurants or go for a hike in the area. At night there is a Casino downtown if that’s your thing. When you’re out for dinner, don’t be surprised if you see a few players out enjoying a meal away from camp. There is plenty of shopping as well, so Kamloops has something to offer for everyone. I hope to see a lot of fans in the stands in Kamloops this week. I hope you enjoy the experience and the beautiful surroundings of Kamloops, BC!